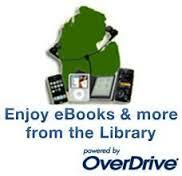 In 2014 we expanded our services with eBooks, audiobooks, music, and video available to download on personal devices. Library card holders with active library cards at Benzonia Public Library can borrow popular digital media anytime, anywhere by clicking the OverDrive link here or on our Home Page or by signing in at upnorth.lib.overdrive.com (be sure to have your library card handy) or by downloading the OverDrive app to your smart device. More than 35 libraries in northern Michigan have banded together to create the Up North Digital Collection to offer online borrowing of eBooks, audiobooks, and videos purchased specifically for remote use. The collection includes almost 9,000 eBooks, over 1,500 audiobooks, 120 music albums, and 112 videos. Users may enjoy reading on all major computers and devices, including iPhone®, iPad®, Nook®, Android™ phones and tablets, & Kindle®. eBooks can be read immediately on any device with an internet browser or downloaded to a device. All titles will automatically expire at the end of the lending period. There are no late fees! We are excited to take this digital leap and offer this service to our patrons. We thank the Friends of Benzonia Public Library for the funding to make this possible. 3 days - music and video. You will need an active library card, and you will need to be a year round or summer resident with a Benzie County address to borrow OverDrive titles from this library. To apply for a library card, present your driver's license and proof of residence address. You do not need to be physically at the library to borrow digital items. You can place up to 5 titles on hold at one time. You can choose to have the item automatically checked out to your account or to receive an email notification when a title becomes available. Once the notice is sent, you will have 2 days (48 hours) to borrow the title. If you don't retrieve it in time, the title will be made available to the next user on the list.